Leptis Magna is commonly known as Lectis Magna or many times spelled as Lepcis Magna, it is also popular as Lpqy as well as the Neapolis, was an important city during the Roman Empire. The ruins of Leptis Magna city are located in Libya in the Al Khums which is located at a distance of nearly 130 km to the east of Tripoli. It is located on the coastal region of Wadi Lebda and its interjection with the sea. The site is also popular as one of the most impressive and untouched Roman ruins in the Mediterranean region. The city was been found around 1100 BC and is supposed to be found by the Phoenician colonists. The city gained the importance during the rule of Carthage in the Mediterranean Sea. Carthage ruled the region in the fourth century BC. Till the third Punic war which took place in 146 BC, Leptis Magna was the part of the Carthage’s empire. 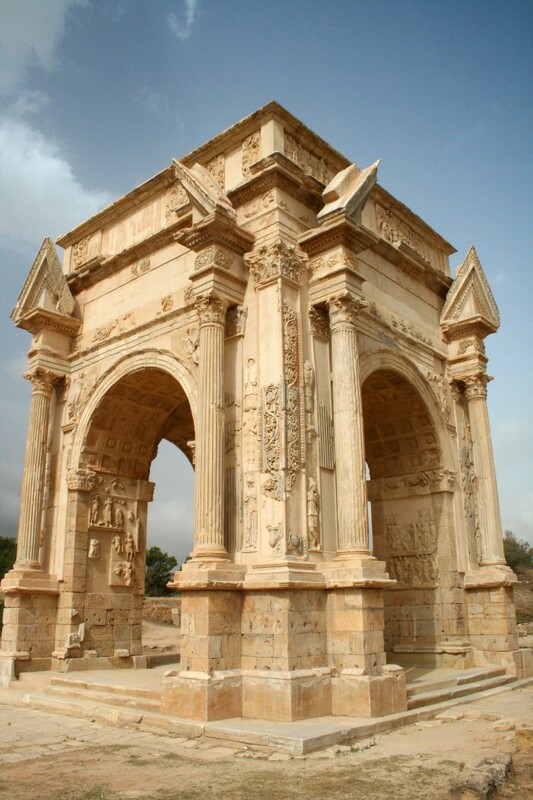 From 200 BC Leptis Magna was known for being an important and independent city. During this period it came under the rule of the Roman Empire. During the rule of the roman emperor Tiberius, Leptis Magna as well as its neighboring areas as well as adjacent provinces were formally as part of the emperor also it was declared as a province of the Africa region. Sooner Leptis Magna became a important city as well as a trading post of the Roman African region. Leptis Magna became more important city in the early of 193 BC when the rule of Lucius Septimius Severus. Leptis Magna was his hometown. Lucius Septimius Severus gave a special importance to his hometown thus the city was more developed with many buildings as well as a huge amount of wealth. With a pass in time Leptis Magna became the third most important city in the African region. Carthage and Alexandria stood in the first two places. In 205 the emperor visited Leptis Magna with his royal family also he received great respect and honors. In the month of June of 2005 the archeologists who were working on the coastal region of Libya had found the remains of the city’s colorful mosaics. It was found that the mosaics did belong to the first or the second century. The designs on the mosaics were very much clear and the drawings of the warriors with the deer also four young men who were fighting with a wild bull were clearly seen. The drawings on the mosaic are stated as one the unique representation of the mosaic art. It was a masterpiece in its own way. Originally the mosaic was found in the year 2000 but it was not disclosed to the world due to the fear of the looting. The mosaic is currently kept in the display in the museum of Leptis Magna. Few parts of the age-old temple were brought to the Fort Belvedere which is a royal house which is located in England in the year 1818. Also it lies in the fraction of Windsor Great Park. The ruins are today found located between the Blacknest road and the Virginia Water. Also it is located in the vicinity of the A30 London road and the Wentworth drive.